Mauricio Pochettino’s Tottenham were in fine form at Wembley, putting four goals past an Everton team that once again struggled to create clear chances against a top-six team. Son Heung-min was the star of the show for the home team, scoring the first on 25 minutes and creating another as the visiting defence struggled to cope with the pace and movement of the Spurs attack. Harry Kane netted another two, almost inevitably, with Christian Eriksen completing the rout late on. Tottenham lined up in a 4-2-3-1 formation, shifting to 4-4-1-1 in defence, with full-backs Serge Aurier and Ben Davies operating so offensively to play almost as wingers. Harry Kane and Dele Alli acted as the first line of pressure, while the midfield showed a constant readiness to prevent Everton passing into the centre of their defensive system. Their players wanted to create numerical superiority around the ball carrier, with Eric Dier particularly active in the defensive phase. 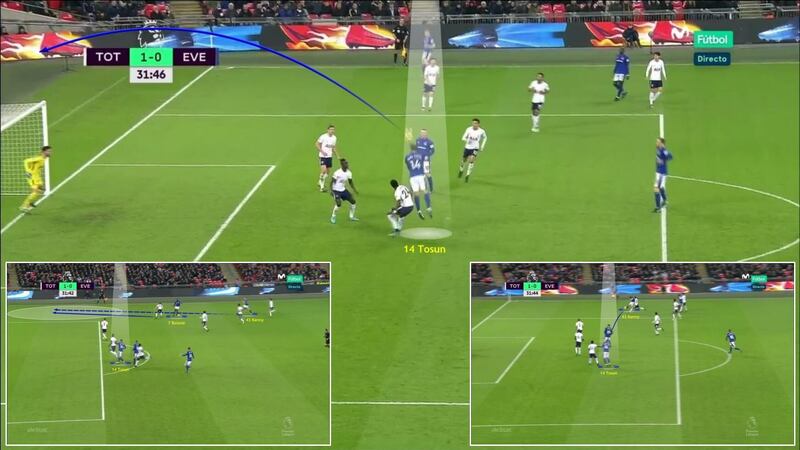 In their own third, they tried to prevent Everton creating numerical and positional superiority close to their box. They had occasional difficulties in the defensive transition, as Everton looked to counter at speed through Wayne Rooney, Cenk Tosun, Idrissa Gueye or Gylfi Sigurdsson. However, they always had men nearby to immediately pressure the opponent after losing the ball. In attack, Tottenham preferred to play out from the back, with Hugo Lloris often combining with the centre-backs, Davinson Sanchez and Jan Vertonghen. Everton worked hard to press high, but Dier, Christian Eriksen and Son Heung-min were constantly able to find space and take possession. 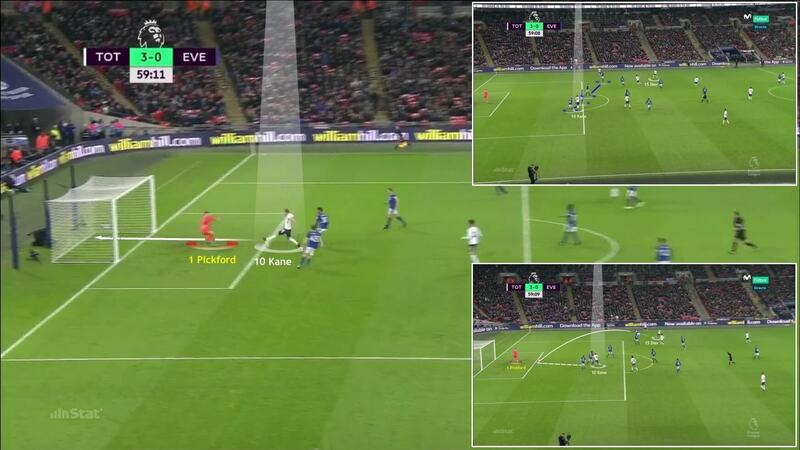 Son, Eriksen and also Harry Kane, when dropping deep, were all able to open different passing lanes and create a free man, allowing easy progress towards Everton’s box. 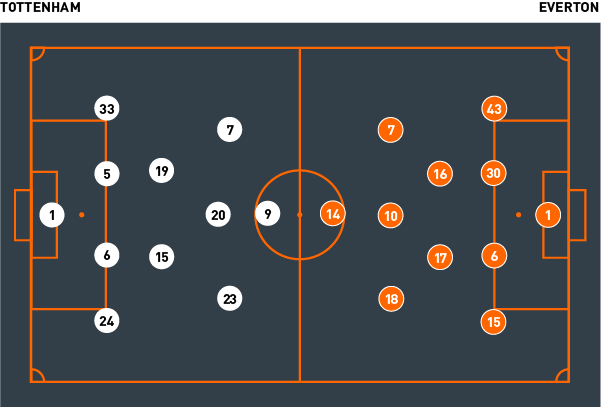 As a result, in the final third they were repeatedly able to break through an Everton defensive line that left plenty of space in behind. 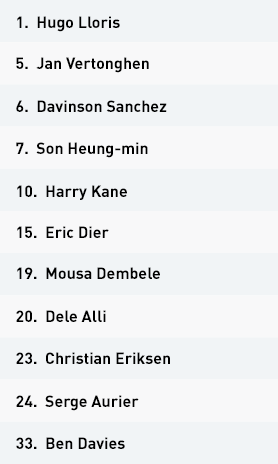 Tottenham lined up in a 4-2-3-1 formation, shifting to 4-4-1-1 in defence, with Christian Eriksen and Son Heung-min dropping back into midfield alongside Mousa Dembele and Eric Dier. In midfield, Spurs showed a hunger to intercept and prevent passes being played into the centre of their defensive system. 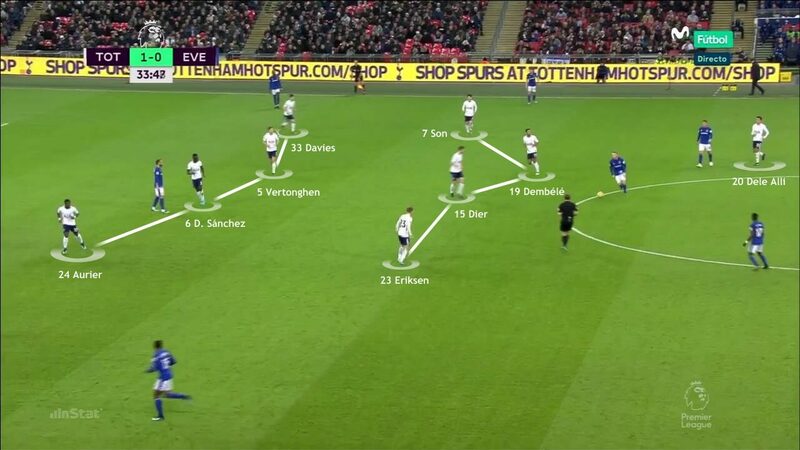 Tottenham wanted to create numerical superiority around the ball carrier. Dier in particular was very active in the defensive phase, winning balls in midfield, although he also provided the assist for Harry Kane for the third goal. The consistent runs of Serge Aurier down the right were the main offensive weapon for Spurs, the space created by the continual movement of Christian Eriksen through the central. This created Son’s opening goal on 25 minutes. 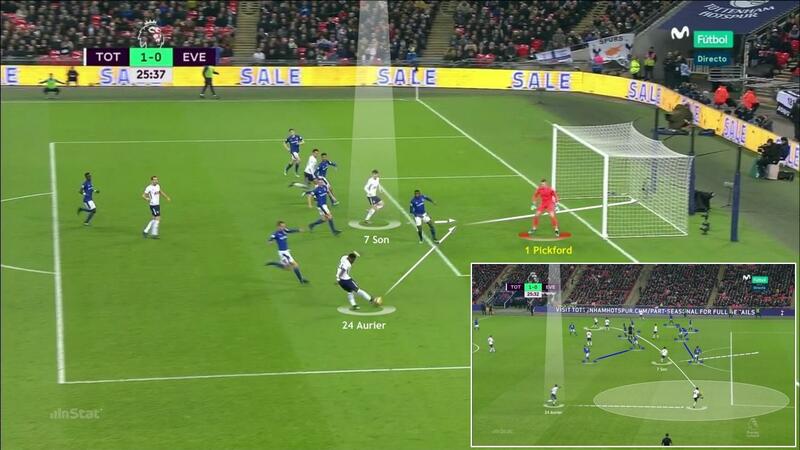 In the final third, Spurs looked to play centrally and use runs from deep to break into the spaces Everton left in behind their defensive line. Here, Dier and Kane combine to take advantage of exactly that. Everton started in a 4-2-3-1 formation, switching to 4-4-1-1 in defence, with Yannick Bolasie and Gylfi Sigurdsson dropping back into a four-man midfield. 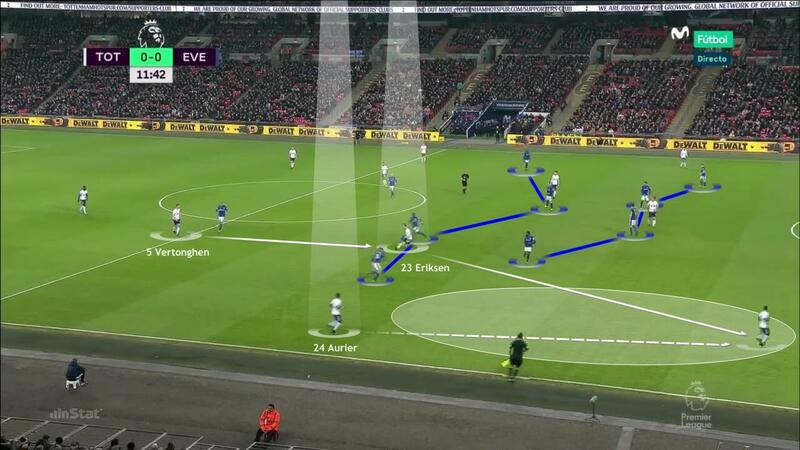 In the defensive third, Everton attempted to clamp down in midfield but gave away too much space on their left side. 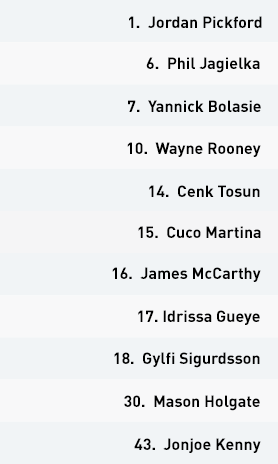 Cuco Martina too often neglected his own position at left-back. 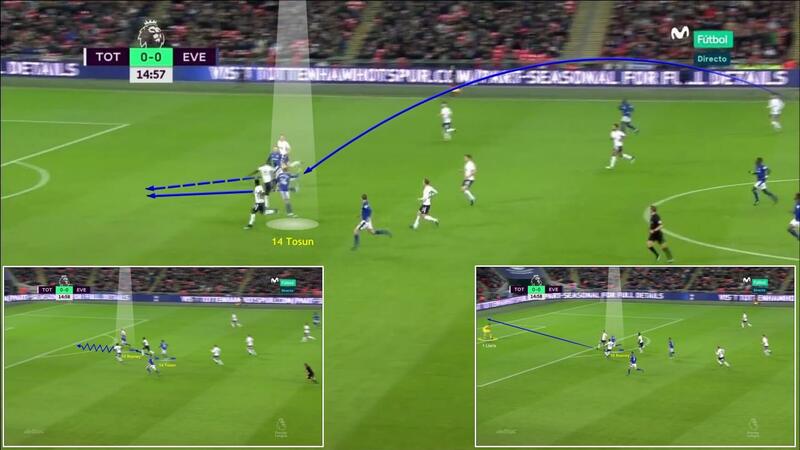 The Everton defensive line suffered hugely when the Tottenham attackers broke in behind or through the gaps. In attack, Everton had to play direct, from both Jordan Pickford and the back four, due to the high press. Though often isolated, Cenk Tosun did offer some threat through his strength in the air. In the final third, however, Everton caused little danger and posed almost no threat. They tried to find the likes of Tosun, Sigurdsson and Wayne Rooney in shooting positions, but without much success. Everton started in a 4-2-3-1 formation, switching to 4-4-1-1 in defence, with Yannick Bolasie and Gylfi Sigurdsson dropping back alongside Idrissa Gueye and James McCarthy in midfield. 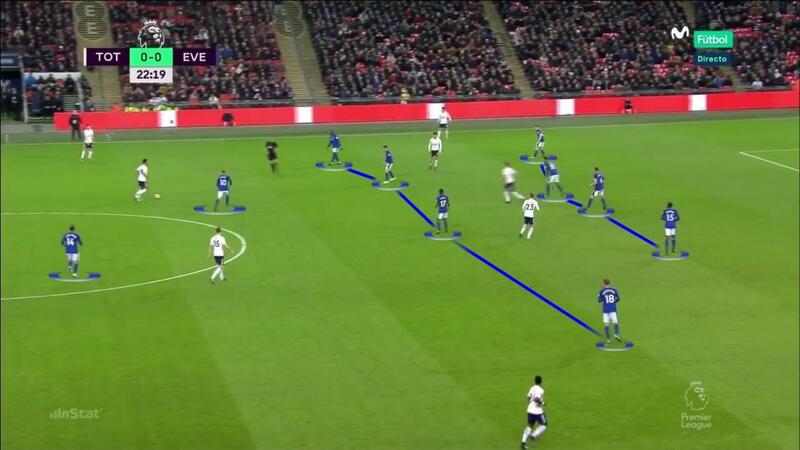 The Everton front line tried to force the Tottenham attackers out wide and prevent their dangerous players taking possession centrally, although they had little success and found themselves constantly overtaken. They worked hard to establish a numerical advantage around the player in possession, but this produced plenty of space both down the middle and on the flanks – and the Spurs midfield were always able to offer passing options. In the defensive third, Everton gave away too much space on their left, with Cuco Martina too often neglecting his own position at left-back. Their defensive line couldn’t deal with the Spurs attackers making runs in behind or through the many available gaps. In their defensive transition, they left a significant amount of space in behind. Their centre-backs were repeatedly exposed, owing to their lack of pace when dropping back into defensive mode. 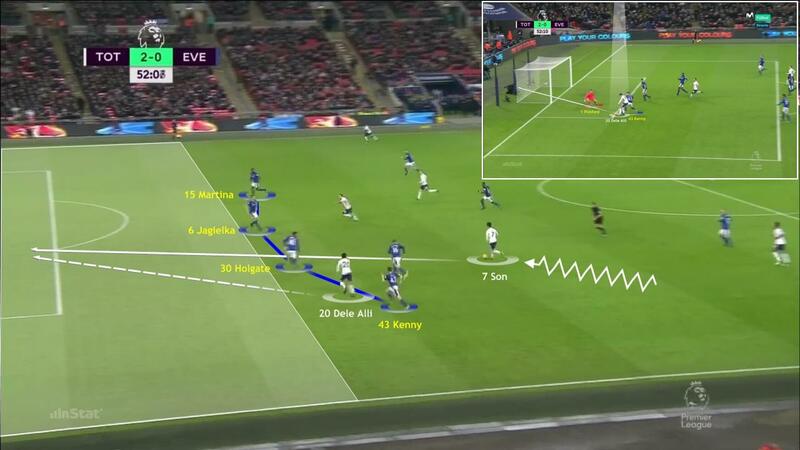 In attack, Everton prioritised direct passes into their forwards – particularly Cenk Tosun, who did offer some aerial threat to the Tottenham centre-backs. They found it difficult to gain any dominance in midfield, where a combination of poor passing and decision-making meant they struggled to find Tosun, Wayne Rooney or Sigurdsson further forward. 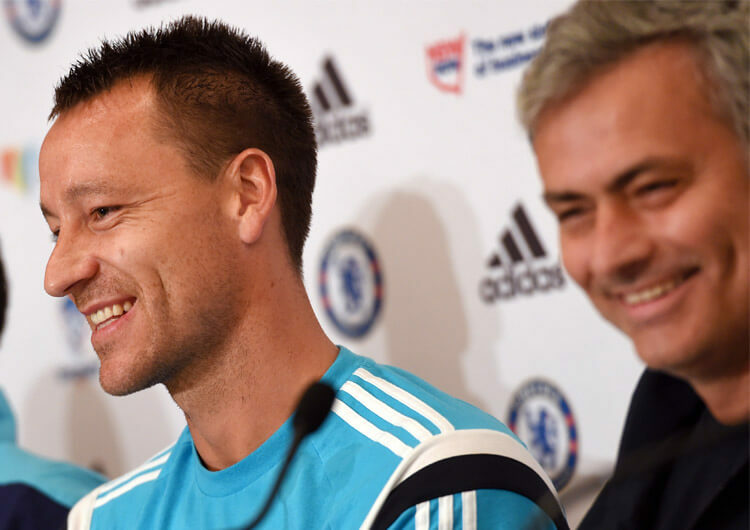 They posed little threat to a well-organised Tottenham defence. After the substitutions of Dominic Calvert-Lewin for Tosun and Aaron Lennon for Bolasie in the second half, there was little marked difference going forwards. Following these changes, along with the arrival of Morgan Schneiderlin for McCarthy, Everton varied their attacking formation between 4-2-3-1 and 4-3-3. There was no real improvement, however. 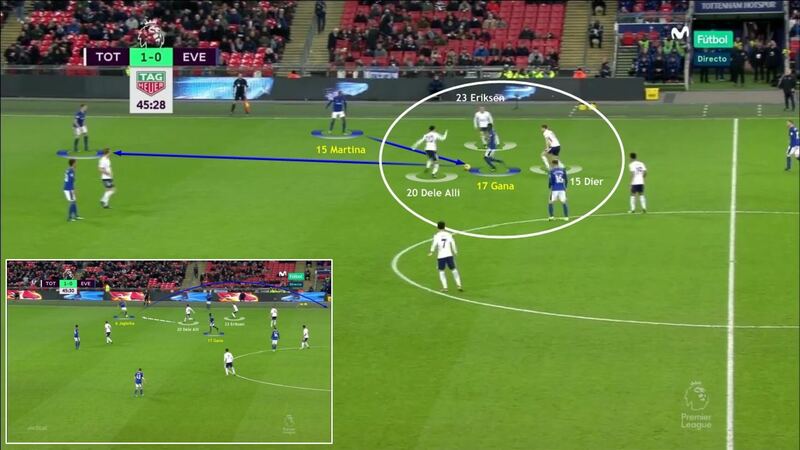 On the counter-attack, Everton looked to play direct into their forwards. They often failed to connect with these passes, however, usually floundering under pressure from an effective Spurs defensive line. Tottenham tried to create numerical and positional superiority in the attacking half. Son Heung-min, Christian Eriksen and Harry Kane were their standout players in these situations, thanks to their constant movement through the middle. Spurs did plenty of damage on the right wing, as Everton tended to press too hard and Cuco Martina was often out of position at left-back. The runs of Serge Aurier were a constant threat, Son scoring the opener from this area. Son proved a consistent presence throughout the match, providing both a goal and an assist. Kane, scoring twice to overtake Teddy Sheringham with 98 goals in the Premier League, was a constant outlet for his teammates. Everton tried to make life difficult for Mauricio Pochettino’s side, but any good work was undone with the Tottenham opener and further undermind by a poor second half. Cenk Tosun had a good game on his Premier League debut, giving the Spurs defence a real headache with his aerial prowess in particular. 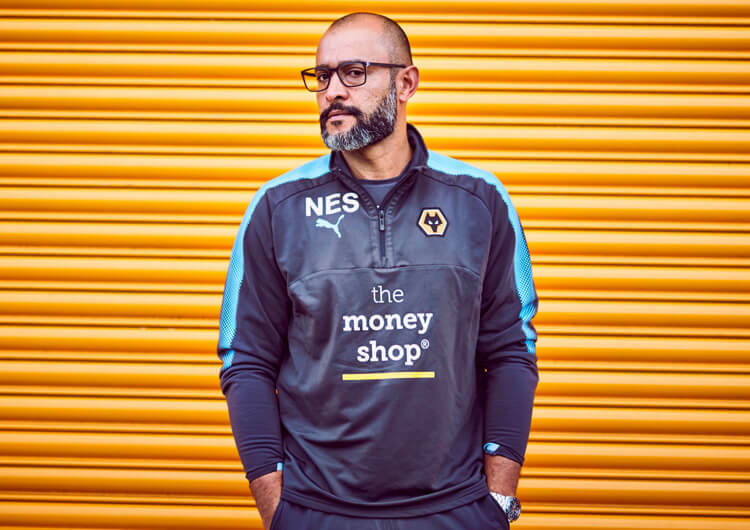 With more support, he can be effective for his new team.